In the 1880s, Yale University athletic director Walter Camp transformed a common game rooted in rugby and soccer into modern football. 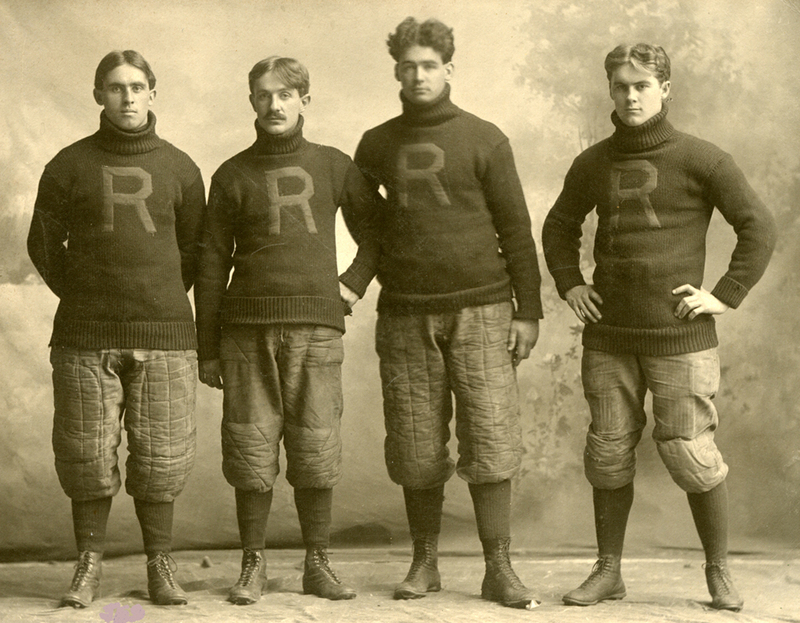 Camp created a new system of rules for the game, and within a few years football became a staple at eastern schools such as Harvard and Yale Universities. Formal football teams spread westward to schools across the country. Beginning in 1892, Rush Medical College played against a wide variety of football teams. Rush faced other colleges, such as the University of Chicago (the Maroons) and Northwestern (the Purple). They also played high school teams and local sports clubs, such as the Chicago Athletic Association. Small schools like Rush suffered a distinct disadvantage when they played larger schools. Large universities had significantly more players to choose from, and they drew older, and often larger, students from their professional schools. The reasons for the demise of Rush’s sports teams are unclear and may not have been documented. One possible reason the athletics program ended could be related to Rush Medical College’s affiliation with the University of Chicago, which began in 1898. The last mention of Rush’s sports teams can be found in a November 16, 1904, Chicago Tribune article which described a Rush football game against the College of Physicians and Surgeons. This information and more was spotlighted in my 2007 exhibit, “Battling for the Honor of ‘Old Rush’: Sports at Rush Medical College, 1892-1904.” For more information about Rush sports teams, please contact the Rush Archives at (312) 942-7214 or rush_archives@rush.edu. Nathalie Wheaton is assistant archivist with Rush University Medical Center. This entry was posted in Rush Archives, Rush University and tagged football, rush medical college. Bookmark the permalink. Hilarious! I would never had guessed Rush had a football team! While I was in grad school at Rush, we used to joke about all our “sports teams” but I never knew they actually one in the past! Who knew??? That’s very interesting! Thanks for sharing! OMG the news paper quote is a riot! I also find the team names interesting- so different from contemporary names. Then there’s the padded britches . . . great photo. That looks like awfully little protection for football. The medical staff must have had a blast!